While most of the aircraft builders at NBAA [National Business Aviation Association] build their products out of tons of aluminum or increasingly carbon fiber, one new exhibitor here builds them out of thin air. 3DVisualization Service is demonstrating its technology (Booth no. 2885), which allows customers to create a virtual aircraft and enables people to actually walk through it, long before the first metal is ever cut. Once you place the virtual reality headset over your face, you are transported into a surprisingly realistic virtual environment. The level of detail is stunning, right down to the weave of the carpet. A newspaper rests on a table along with a pen and a smartphone. Across the aisle another table is set for meal service. A glance out a cabin window reveals clouds slowly drifting past in a blue sky. As you walk over and sit in a real chair, your virtual perspective changes as if you were settling into a plush leather club seat. Indeed a full cabin could be laid out with actual furniture acting as place holders for what the user is experiencing as they stroll through the cabin. The experience is immersive. A glance at the virtual large-screen flat-panel television shows it is playing a scene from The Avengers; the movie’s soundtrack volume even increases in the headset’s speakers as you walk towards it. “The more things you can put in it, the better the experience for the user,” said company president J.P. Mangano. 3DVisualizations began a decade ago creating interior renderings for customers including heads of state and the Saudi royal family. It has even done Air Force One. To create the virtual wizardry, the Miami-based company–which is making its NBAA exhibitor debut–uses CAD design files provided by the aircraft manufacturer as a starting point. To achieve the incredible level of realism, the company requests actual samples of the interior materials, which it then scans into its virtual world. The company then creates the detailed renderings from which it will develop the virtual reality walk-through. The entire fairly labor-intensive process can take one to two months, and depending on the size of the aircraft can cost more than $30,000. Mangano said he believes that price will decrease as technology advances. The approximately $20,000 system is fully portable, consisting of a laptop computer, a Microsoft Kinect camera (as used on that company’s Xbox gaming system) and a custom 3-D headset produced by Sensics. Among its clients, 3DVisualizations counts airframers such as Embraer, Dassault, Piaggio, Pilatus and Piper, as well as completions specialists Gore Design Completions, StandardAero, Associated Jet Center, Jet Aviation, and Lufthansa Technik. Given the transportability of the system, those companies can take it to principals or designers for a “walk-through” to get their final seal of approval before costly purchases are made. 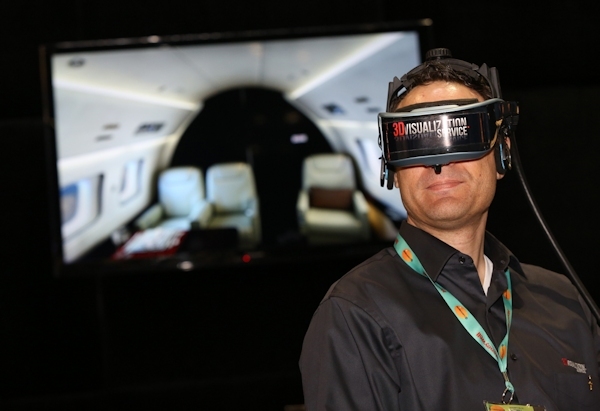 The company introduced the new virtual reality product a year ago and since then it has done large cabin aircraft such as the Boeing BBJ, Embraer’s Lineage 1000 and an Airbus A320. According to Mangano, the company could even theoretically create a virtual mammoth A380. The company also produces three-dimensional animation so sharp, one could be forgiven for mistaking it for high-definition video. The animation can be used for a variety of purposes from demonstrating operational scenarios to depicting manufacturing techniques.